After his initial training and early work in Mirecourt, François Nicolas Voirin moved to Paris in 1855 to join his cousin Jean Baptiste Vuillaume. His work in the Vuillaume workshop gave him access to distinguished bow makers of the Peccatte school, ...Read More but Voirin was inspired largely by the work of Pierre Simon and of Vuillaume himself. Most of the firm's "picture" bows of this period, which feature an eye with a tiny lens microfilm of Vuillaume, are by Voirin. In 1870 Voirin set up his own workshop and gradually his model began to change. Frogs continue to be in the style of Vuillaume, but heads are increasingly thin and refined for the rest of his career, which is an unusual transition for a bowmaker. In fact, Voirin's stylistic evolution is a fitting narrative for the prevailing transition between the square and powerful Peccatte school and more delicate Vuillaume school in the latter half of the 19th century. 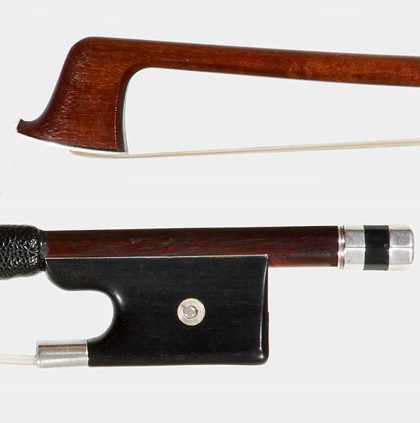 - The auction record for this maker is $37,177 in Nov 1999, for a violin bow. - 741 auction price results.